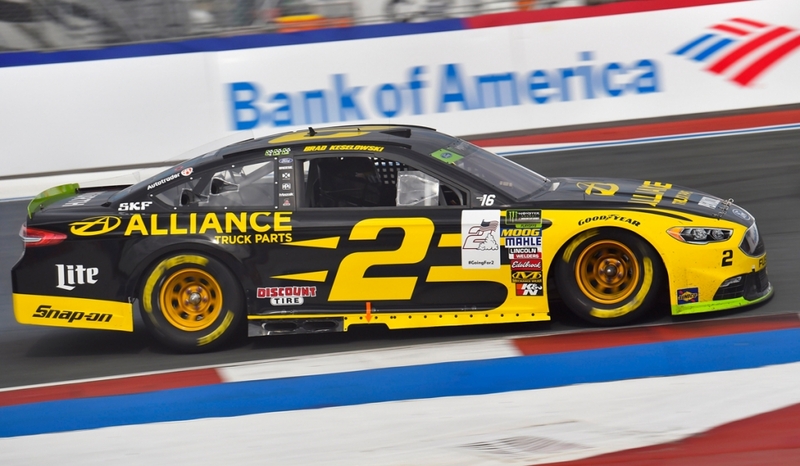 Brad Keselowski saw his chance to win the Monster Energy NASCAR Cup Series race on the ROVAL at Charlotte Motor Speedway evaporate just six laps from the finish on Sunday afternoon. Keselowski was the leader when the race went green on lap 104 following the seventh caution. As he and Martin Truex Jr. raced side-by-side for the lead entering the first corner, his No. 2 Alliance Truck Parts Ford Fusion simply didn’t turn, landing nose-first into the outside tire barrier. The heavy traffic following the restart created a chain reaction incident that collected a total of 15 cars and halted the race for nearly 15 minutes for track repair. He was credited with a 31st-place finish in the final rundown and is fourth in the MENCS driver standings, 30 points behind the leader. Two cautions early in Stage 3 gave Keselowski the chance to contend for the victory. He pitted on lap 60 for four tires and repairs to his left rear. Another caution on lap 67 gave him the chance to pit for tires and fuel – and perhaps get him to the end of the race. Keselowski restarted 29th but once again slicked his way through traffic. He moved up to fourth-place when most of the leader pitted for tires and fuel on lap 70 and grabbed the lead on lap 75. From there, Keselowski was tasked with keeping the lead all while trying to stretch his fuel mileage to the max. He was doing well at both, fending off a serious challenge from Kyle Larson as the race neared the 90-lap mark. But on lap 103 Ricky Stenhouse Jr. brought out the seventh caution and just one lap later Keselowski’s chances to win were gone.